history and architectural integrity of the Glen Ellyn community through historic preservation, planning and sensible growth. We invite you to the annual meeting of Citizens for Glen Ellyn Preservation, which will be held at 7:00 p.m. on August 4th at the Glen Ellyn Boathouse during a joint meeting with the Village of Glen Ellyn Historic Preservation Commission. During the meeting, Granacki Historic Consultants will present the results of their latest historic resource survey of the southeast section of Glen Ellyn, plus recap the architectural styles as documented in their four previous surveys. Granacki states that identifying and documenting the architectural and historic treasures of a community is the first step towards preserving a community's unique character. The discussion will give you a chance to learn more about the architectural styles present in Glen Ellyn, plus the criteria used in highlighting potential landmark homes. Following the presentation, there will be a brief Citizens for Glen Ellyn Preservation Meeting highlighting the coming year’s initiatives, followed by time to enjoy refreshments and the company of other preservation-minded citizens. Please RSVP to Chris Wilson if you can attend at 708-744-5715 or email her at seacwilson@aol.com. 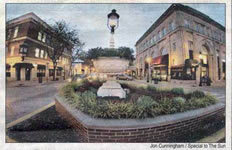 The Village is considering removing its iconic horse trough from the brick island in the center of Main Street and replacing it with either an obilisk-shaped brick structure bearing the name of the village or a replica of the cupola on the Civic Center. To see the drawings click here (pdf). For more information on the horse trough click here (pdf). Last summer, in response to the potential demolition of the original WPA-built headquarters and superintendant’s residence of the DuPage County Forest Preserve, a large coalition of preservationists, government organizations and residents came together in support of saving this remarkable piece of Illinois history. 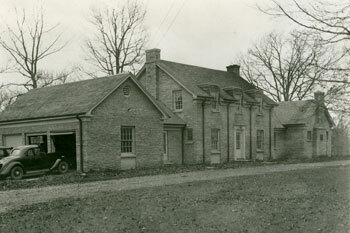 Dedicated in 1936 to the residents of DuPage County by the Works Progress Administration, the stately Colonial Revival headquarters/residence, shop and well house were constructed of Naperville limestone by CCC relief workers. Preservationists have long been recommending that care be taken when removing lead paint and asbestos during restoration work. New EPA rules are finally in place and, while contractors may grumble about the inconvenience, this is a good thing. Contractors who work on pre-1978 homes will need to take a short certification class that applies to lead paint removal. While some contractors have always taken precautions, all will now be required to follow lead-containment procedures. Homeowners who are doing their own work do not need certification but must also follow the EPA's lead removal rules. Many in the construction industry were caught off-guard by these new health-protection policies, so if you are having work done that will disturb old paint, be sure your contractor is qualified to do the work. Cheap fossil fuels led us astray. Here’s a look at how it happened." Check back for upcoming meetings and events. We are on FACEBOOK and invite you to “like” our page. This page will keep you updated on important preservation topics.